While instant noodles in its current form was invented in 1958 in Japan by Ando Momofuku and first produced in HK in 1969 by Winner Foods, mass-produced, machine made noodle had been manufactured in Hong Kong dating back to the 1930s by Pak Kut Milk & Noodle Production Co (百吉奶麵公司), whose founder Tong Luk-kut (唐六吉, 1896-1961) was regarded as the “King of Noodles” and its products were popular in HK and Southeast Asia. Tong Luk-kut, also known as Tong Pak-kut (唐百吉), was a native of Sansui in Guangdong province. According to his bio in 1947, he had dabbled in a variety of industries in his youth – ranging from pawn shops, paper, clothings to toll roads. He then went to Japan to study agriculture and upon his return set up a modern farm in Hainan island where he raised cows for dairy and grew a variety of vegetable. In the 1930s (one source said 1935, another source said after the outbreak of the Sino-Japanese War in 1937), he moved to Hong Kong where he established a dairy farm in Diamond Hill and launched Pak Kut Noodle at 9 Saigon Street in Yau Ma Tei. By using high quality Australian flour combined with fresh eggs and milk from its farm and using machines to ensure consistency, Pak Kut quickly established its reputation for high quality noodles. A 1954 article described Pak Kut’s production process – the first step involved mixing the ingredients (flour, egg, etc) in industrial mixers. After that the dough was pressed into cloth form and then cutting machines sliced it into thin strips of noodles which were then moved to a clean room for drying. (This differ from the contemporary instant noodles which involved flash frying that gives them much longer shelf life) A marketing wizard, Tong packaged its noodle together with gourmet powder and emphasized that customers could eat the noodles instantly just by adding hot water. He also came up with catchy names such as “Travel Noodle”, “Thousand Years Noodle”, “Dragon and Phoenix noodles” and “Vita noodles” and promoted the products heavily at the Chinese Products Expo organized by the Chinese Manufacturers Association in 1939 and 1940, where its exhibit of real and fake old men eating noodles captured the spotlight. From then on, Pak Kut became a staple at the annual HK Products Expo around New Year time. From old ads, it appears that the store on Saigon Street next to Majestic Theatre also served wonton noodles, Malaysian food and “double skin milk” (雙皮奶), a popular Cantonese dessert made out of milk, egg white and sugar. Australian flour, egg and milk in addition to selling its boxed noodles. The early 1950s was a period of expansion and innovation at Pak Kut. In 1951, Pak Kut appointed Amoy Canning as its distributor in Singapore and Malaysia and Tong himself went to Singapore to help promote its products which were quickly sold out. The same year, it also expanded from Chinese noodles to other forms of pasta such as macaroni and vermicelli. By 1954, all of its noodles were machine made with daily production of 2000 pounds. At the 1954-55 HK Products Expo, Pak Kut launched its new brand of Jade noodles – which were green in color as it was made out of spinach. Outside of work, Tong was very active in community affairs having served as director of the Chinese General Chamber of Commerce, the Po Leung Kuk and the Chinese Manufacturers Association. He was also a devout Taoist and served as chairman of Ching Chung Koon temple (青松觀) in Tuen Mun (which opened in 1949) and director of Fung Ying Seen Koon in Fanling. He was also involved in a number of food industry groups and when the meat industry in 1946. In March 1961, Tong Luk-kut died at the age of 65 at St Teresa’s Hospital in Kowloon and was buried at the Tsuen Wan Chinese Permanent Cemetery. He was survived by 2 sons and 6 daughters – at least four of whom went to the all-girls Lai Chack Middle School in TST. Her eldest daughter Tam Siew-yung (唐笑容) married Tam Kiu-chung (譚喬松), who was the owner of the Wai Ming Ceramics Factory (偉明陶瓷廠). Another daughter Tong Siew-king (唐笑瓊) was a painter and bowling champion. But it was Cynthia Tong Siew-ping (唐笑萍) who succeeded her father and take over the business as manager. 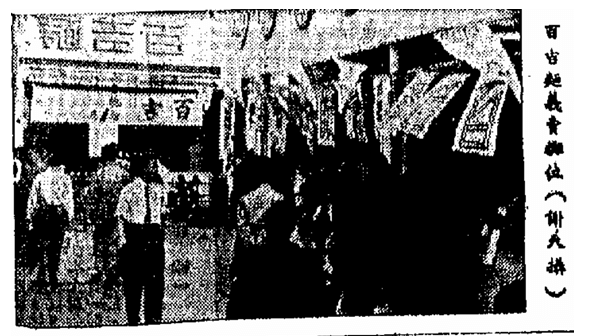 In 1969, the firm’s address was listed as the ground floor of Ko Shun House at 331 Nathan Road and its products included dried shrimp chips in addition to noodles. The rise of instant noodles in the late 1960s and early 1970s overshadowed Pak Kut and not much info is available about the firm in the early 1970s. 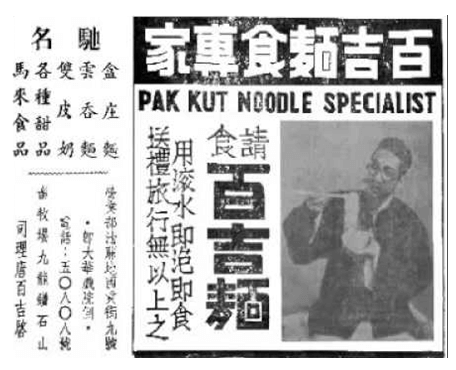 In 1977, Pak Kut Food Products International (百吉食品國際有限公司) was formed and the next year registered the Pak Kut Noodle trademark with the US Patent & Trademark Office. In 1983, the Wing On group (best known for its department stores) perhaps inspired by the success of Winner Food and Doll noodles decided to acquire Pak Kut Food for an undisclosed sum. To expand the noodle business, Wing On invested HK$45 mil in a new 100,000 sq ft plant in the Tai Po Industrial Estate and formed a new subsidiary known as Wing On Foods, although the products continued to be branded under Pak Kut. In 1985, the Pak Kut E-Fu noodles received the Q Mark certification from the Federation of HK Industries. By then, Pak Kut was making 20 different types of food including instant noodles and macaroni that were exported to the US and Canada although it was loss making. Pak Kut Food Products was dissolved in 1991 and Wing On Foods was dissolved in 2004. This article was first posted on 9th March 2018. Thanks for the cool story about my great grandfather. My grandmother is Tong Siew-Yung and she’s told me stories about him all my life. It’s amazing to see this online. I’m planning a trip to Hong Kong to learn more about him. 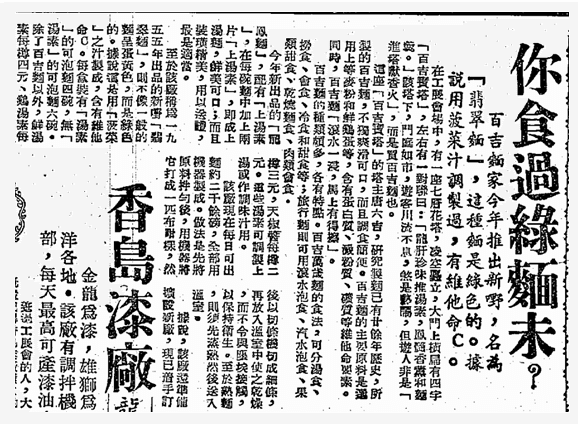 I would love to know where to find more articles about Tong Luk-kut. Please contact me via email.